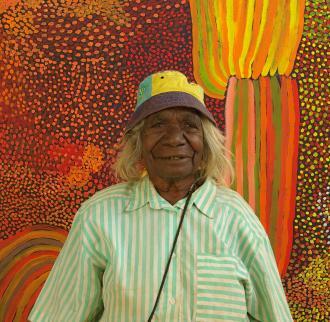 Kuji Rosie Goodjie was born about 1935 near Nyirla, at Kulyayi waterhole, near Well 39 on the Canning Stock Route. She moved with other family members north along the Canning Stock Route towards the white settlements of the Kimberley cattle station country. She moved first to Kururrungku (Billiluna) station where she milked the nanny goats, working for rations. Later she moved to Christmas Creek station. In the 1980s, Wangkajunga Community was established on land excised from the station. From 1994 to 1998, some senior desert people began recording their stories at Karrayili Adult Education Centre. When the Karrayili annex closed in 1998, a number of senior people had become adept at painting. Rosie Goodjie was amongst those artists. Rosie paints the country where she grew up with her family before they were separated from their country and moved to Christmas Creek Station. She currently lives at Wangkajunga and sometimes camps at the homeland of Ngaranjadu. In 2002, Rosie appeared in the film ‘Rabbit Proof Fence’.